When you sign up your kids to dance classes, you don’t just introduce them to an outlet where they can practice and be the best dancers they can be, you also allow them to learn basic life skills that they can use throughout their lives. The first thing your kids get to learn in dance classes is the ability to listen and learn. Kids master this skill when they listen to their teacher and to the music. It will take a good listener to be a good dancer. They need to listen more closely so they can stay on beat. Most importantly, a good listener also goes a long way in life. Kids need good listening skills to perform well at school and to communicate well with others. In dance classes, students are taught how to keep their heads up and to stand straight. When practicing dance, the muscles that enables them to have a good posture are being developed without them even realizing it. Dance classes make kids aware of how good posture can create good body language. Dance classes require children to always look neat and wear proper dance attire. Learning how to dress to impress young is good way to develop organization and cleanliness. Later in their lives, they can make better first impressions by minding how they look. In a dance class, your kid gets to meet a lot of different individuals including the other dancers and the teachers. During dance class, kids are taught how to share, listen, and respect others. 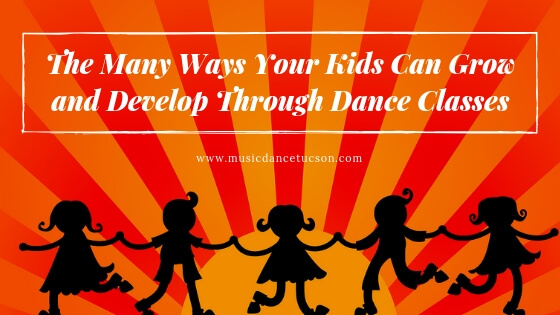 This is the most important virtue they can learn from dance class as this will determine how they can have good relationships when they grow up. These are just a few of the ways your kids can grow and develop in dance classes. Thinking of enrolling your kids to dance classes anytime soon? Take the next step with us at the Music & Dance Academy Tucson. The academy emphasizes quality, the development of dance technique, confidence and self-esteem through innovative teaching methods that make learning different dance styles enjoyable and rewarding for students of all ages and levels.